Florian Tools are made in Connecticut. The 701 Ratchet Cut Hand Pruner has a Lifetime Warranty against defects in materials and workmanship. 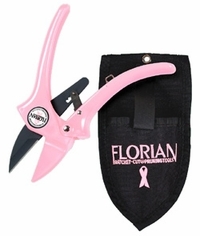 Breast Cancer Benefit Pruner - Florian Tools will donate $1.00 for cancer research for each pruner sold. All gardeners, from novice to professional, benefit greatly with this powerful hand pruner. Features of this unique hand pruner include a high carbon spring steel pruning blade. The pruning blade on this hand pruner is Teflon coated to resist pruning residue buildup. The handles of this hand pruner are fiberglass-reinforced nylon. The Cordura Nylon Holster for this hand pruner is included for safe storage. Our patented Ratchet-Cut mechanism works like the jack on your car. This mechanism multiplies your strength up to 700% when pruning with this hand pruner. This hand pruner will allow people with arthritis, carpal tunnel or diminished hand strength to once again enjoy the pleasures of gardening.